On March 6th, 1869, Russian chemist and inventor Dmitri Mendeleev presented the first Periodic Table of Elements to the Russian Chemical Society. Not only has his table expanded over the past 142 years to accommodate new elements, its format has been adapted to uses ol’ Dmitri could never have imagined. Here are 13 of the oddest. The Oxford Science Park is “where the business of science comes to life”. 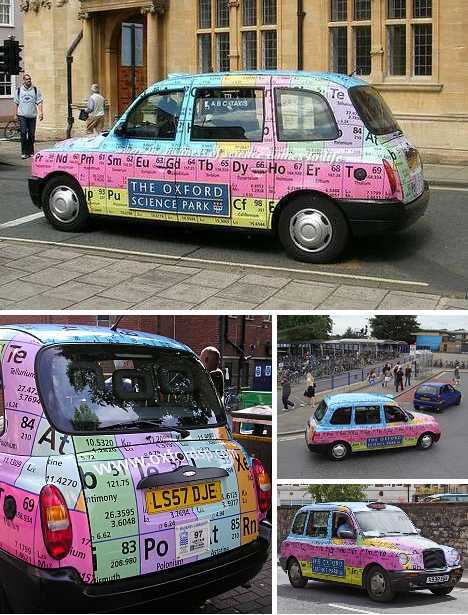 Since I don’t understand what they’re talking about, here are some local taxi cabs that have traded their usual solemn black for a multicolored graphic of the Periodic Table. Call for a cab; you just might get Cadmium. 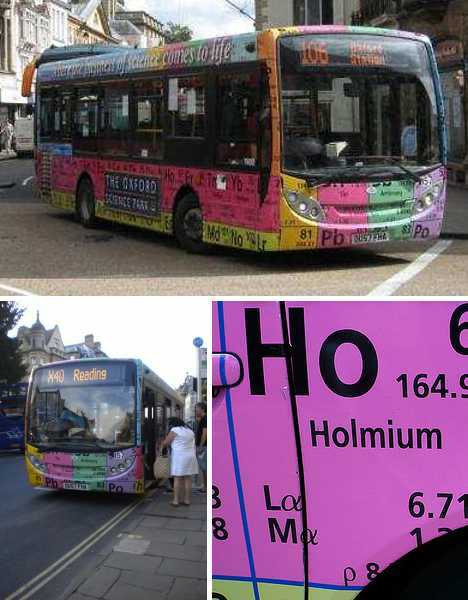 In addition to taxi cabs, at least one bus belonging to the city of Oxford’s public transit commission is painted up to display the periodic table of the elements. Tourists, travelers and commuters should be aware, however, that the bus only runs… periodically. Seriously though, according to The Oxford & Chilterns Bus Page (a Brit bus-geek fan site, it seems), the colorful city cruiser is a Thames Transit Alexander Dennis Enviro 200 Dart. Just thought you’d like to know. 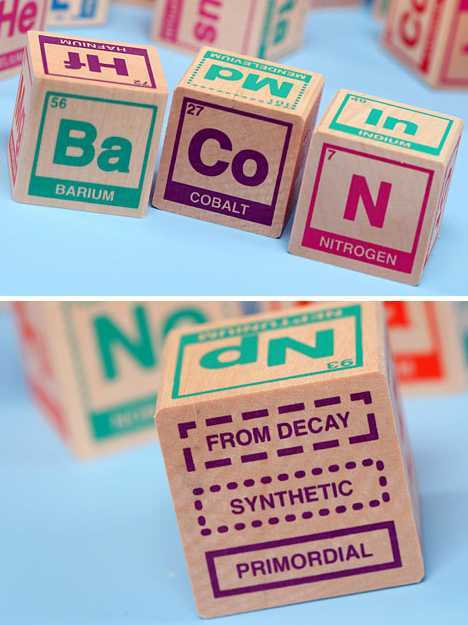 Elements are the building blocks of, well, everything… even bacon! 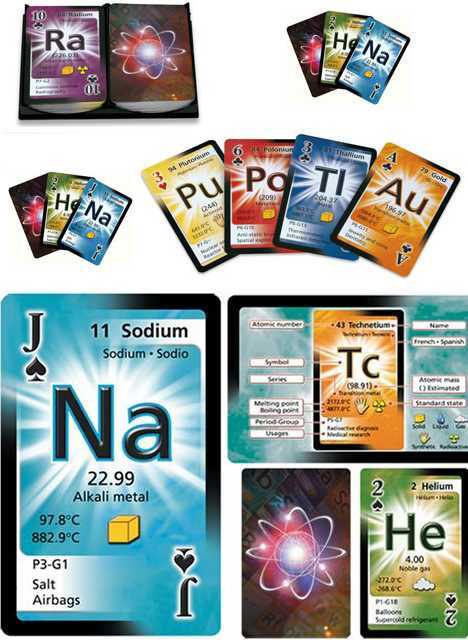 As such, Periodic Table Building Blocks would appear to be obviously cool though possibly redundant. Not to mention high-fiber. 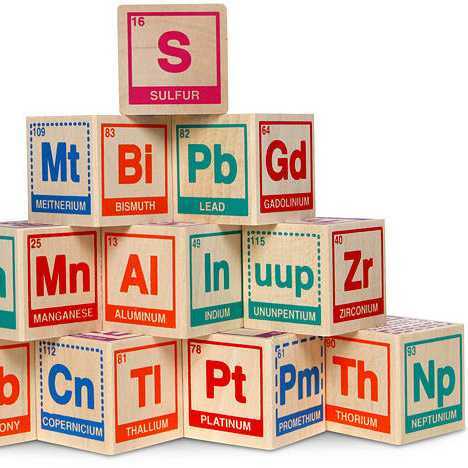 These 20 solid wood building blocks feature all 118 elements of the periodic table. 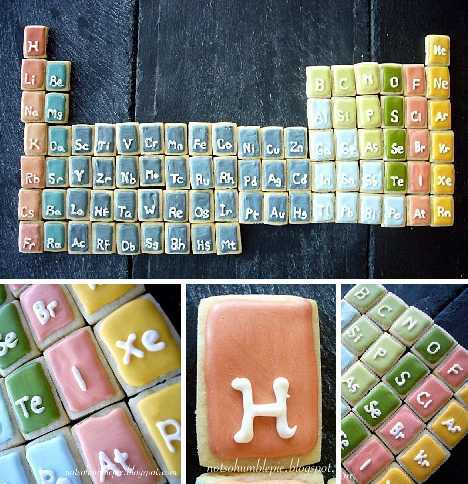 Yes, even Ununoctium is included but sadly, no Unobtainium. 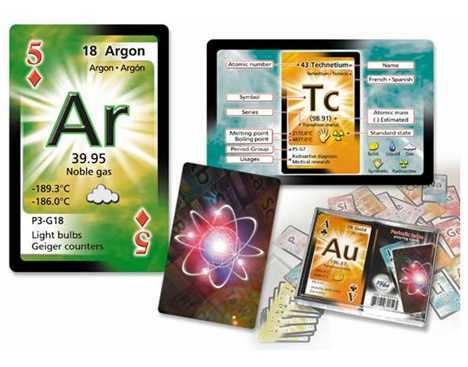 Periodic Table Building Blocks are the perfect gift for wee geeks, young Einsteins and your blockhead brother-in-law’s kid. We’re assuming they’re colored with plumbum-free paint. If Sarah Palin were a chemist… well, that was just too easy. 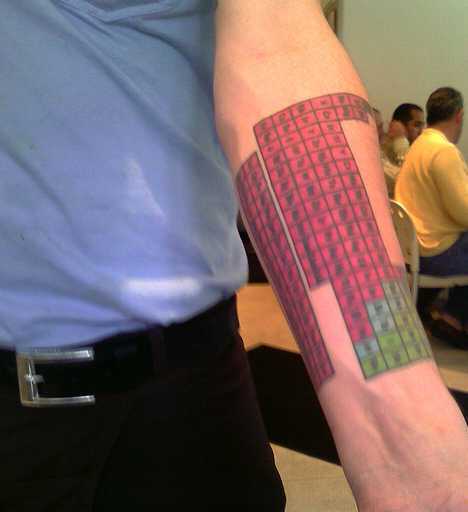 What couldn’t have been easy was applying The Periodic Tattoo of Elements. One assumes the tattooee visited the tattoo parlor perio… er, from time to time and had the thing done on the installment plan. 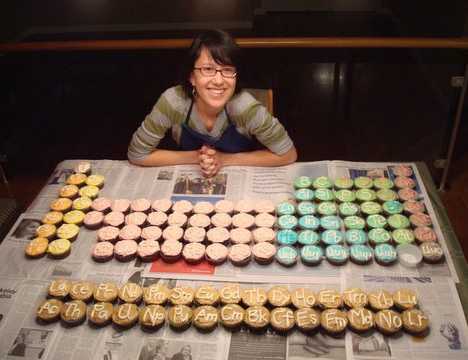 If your BF is a chemistry major in college, does that make you a geek chick? 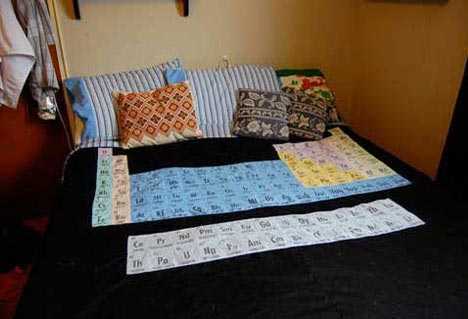 If you make him a Periodic Table of the Elements Duvet Cover, then I think the answer is obvious. The talented and thoughtful gal who made this quintessential chem quilt happen was nice enough to document – with photos – the whole construction process from A to Z. Or from H to Uuo, as the case may be. Pop an electric blanket and a duvet inside the cover and you’re good to go… to sleep, that is. Imagine drifting off to dreamland, covered and warmed by a list of elements that were originally formed in the hearts of exploding supernovas. Hey, it beats counting sheep, amiright? 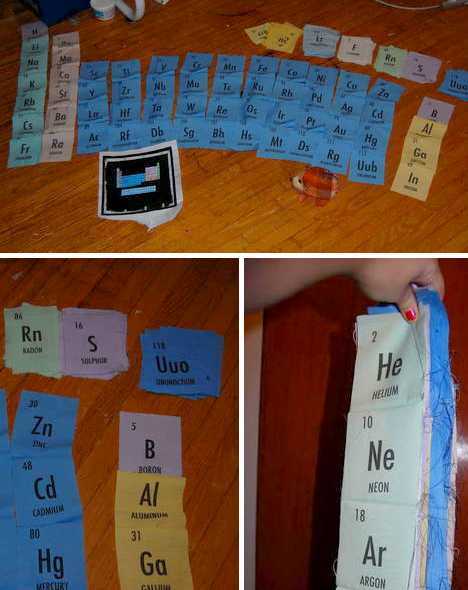 Only two elements (Bromine and Mercury) are liquids at standard conditions for temperature and pressure but with the Periodic Table Shower Curtain, you can get ’em ALL wet! The fun doesn’t stop there, either: observe the elemental properties of Hydrogen and Oxygen while H2O gently washes away the day’s accumulated rare earths. It’s a great way to add an element (or more) of surprise to your showering experience. 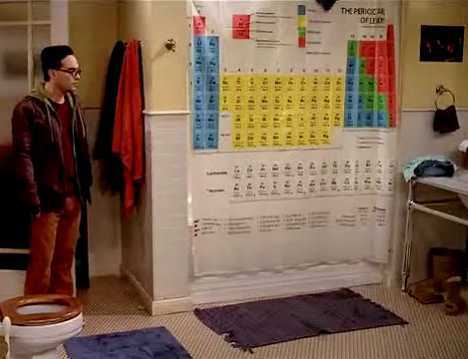 Fans of the TV sitcom The Big Bang Theory may recall the scene in the series’ pilot episode in which Penny decides to take a shower over at Leonard’s place – right behind his semi-transparent Periodic Table Shower Curtain. 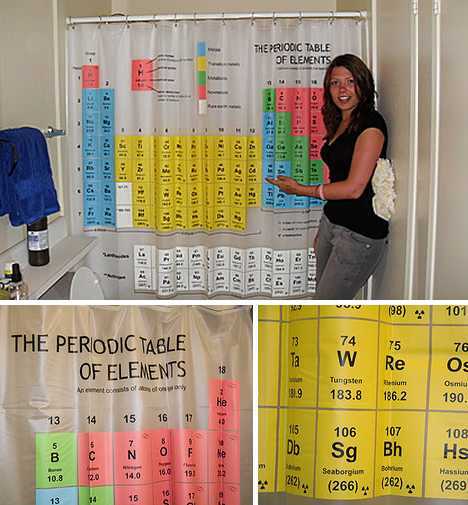 Own the 71 inch square Periodic Table Shower Curtain and you’ll be able to recall that it’s made of EVA (Ethylene Vinyl Acetate) and Polyethylene… assuming you can get those memories of Penny showering out of your head. Think you’re smarter than the average bear? 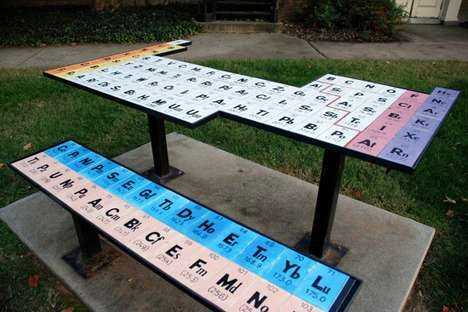 Than check out the Periodic Picnic Table, built as an art project by a Wake Forest University chemistry student. The Periodic Picnic Table is built on two levels, with the Actinide and Lanthanide elements making up the bench portion. 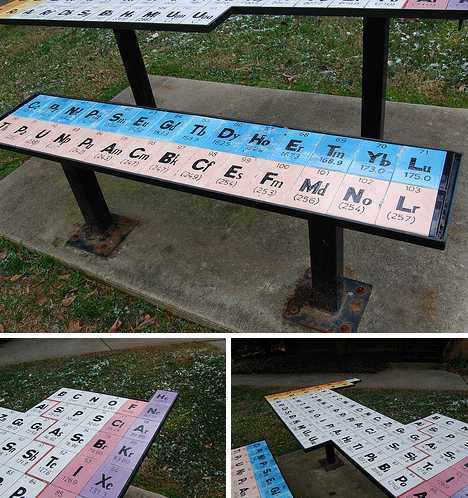 The Periodic Picnic Table can be found just outside Salem Hall, the chemistry building at Wake Forest University in Winston-Salem, NC. It’s a great place to study for mid-terms since no aspiring chemist wants to make a boo-boo. 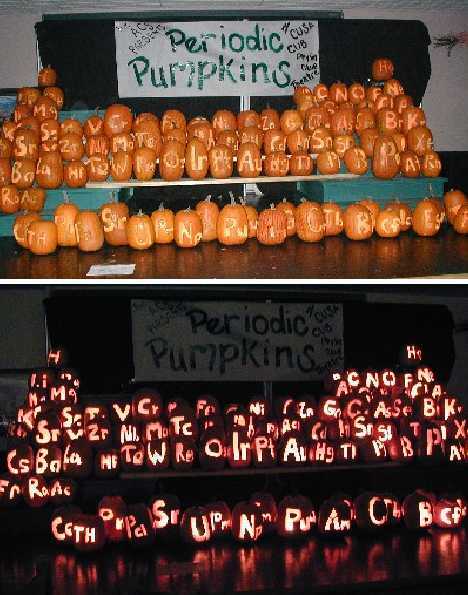 What better way to celebrate National Chemistry Week (Nov 4-11) than by slicing up a few dozen pumpkins to form the most frightening Periodic Table EVER? That’s what students and faculty at Clarkson University thought, and nobody wanted to squash the idea. Ever wanted to serve a piping hot Arsenic cupcake to your conniving ex, noisy neighbor or any number of telemarketers? Sure, we’ve all been there – figuratively, at least. 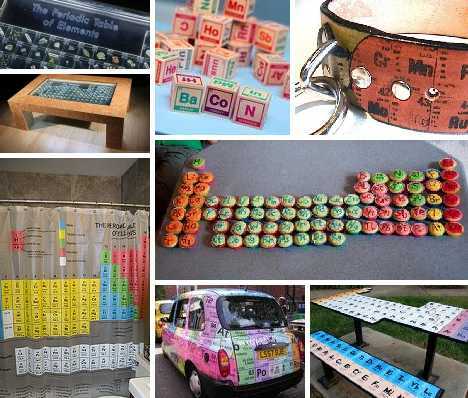 So have the creative folks at GadgetHim, except they’ve covered all the bases with this tantalizing Periodic Table made from Cupcakes. Tantalum included at the baker’s discretion. 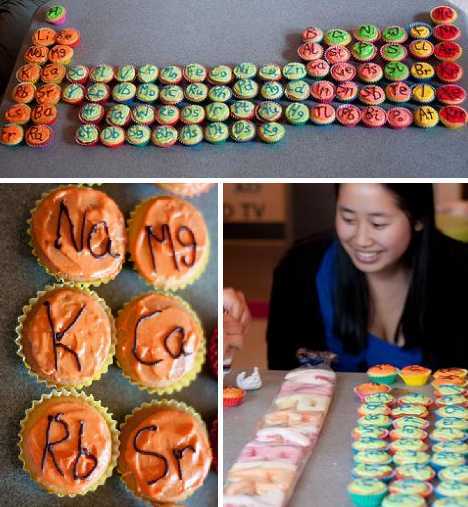 While this tasty table only uses cupcakes to represent the known elements, actually eating all 120 of the colorful chemical confections would probably give the eater an atomic case of indigestion. Maybe just the tops? Who says chemists ain’t got no sole? Periodic Table of Elements Keds Shoes are the perfect footwear for outdoor recreation, leisurely strolls, brisk jogs and school chemistry exams… well, maybe not that last one. 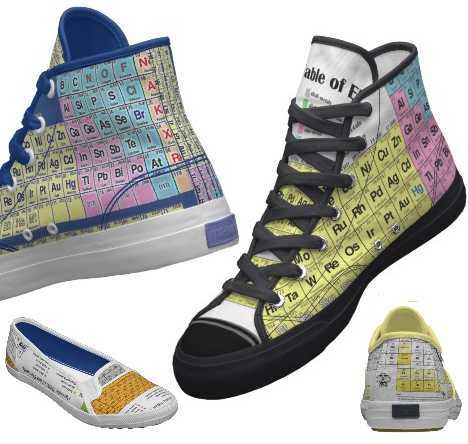 Available in hi-top, low rise, loafers and more, Periodic Table Sneakers are sure to cause a reaction of the nuclear variety. 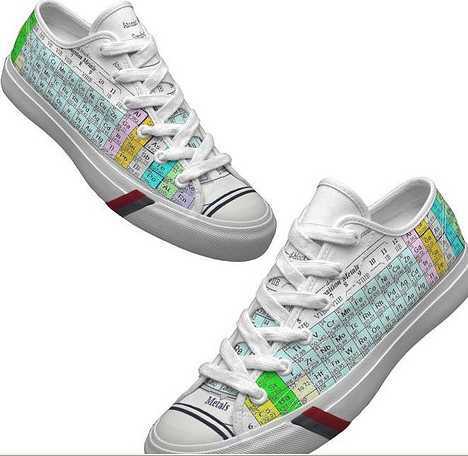 If sports is your game, these Periodic Table Sneakers are just the thing for running the acids and bases. They’ve passed the litmus test for quality and they grip the pavement tighter than a Fluorine ion in a heated solution. This double deck of http://www.amazon.com/dp/0973950668/ref=asc_df_09739506681448700/?tag=thebeat&creative=394997&creativeASIN=0973950668&linkCode=asn consists of 104 cards featuring one element per card. What’s the fifth element? It’s a movie starring Bruce Willis and Milla Jovovich but we haven’t got time for that now. You & your card-playing buddies will find it hard to keep a poker face when each card provides interesting info on the elements in English, Spanish and French. Gotta full house with Uranium and Plutonium? You win the pot AND the war. Old and busted: spiked dog collars. 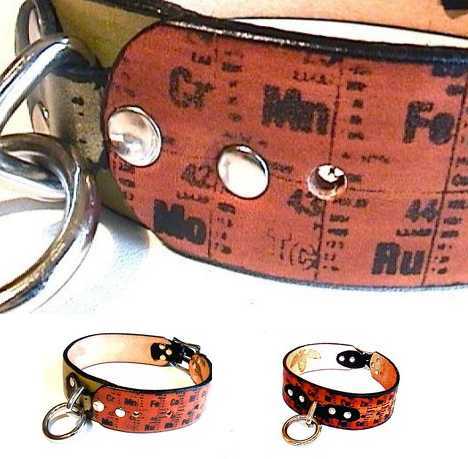 New hotness: Periodic Table Dog Collars! Perk up your canine with a little Iodine… and a few other elements from the classic Mendeleevian chart. San Francisco artist Jacob Vaughn Gushue makes these an-atomic dog collars from reclaimed leather and while only a few elements can be shown on the limited surface area of each collar, enough is shown to give the right impression. Your Pluto might not be powered by Plutonium but even if he/she is neutered, adding some neutrons has to be a good thing. 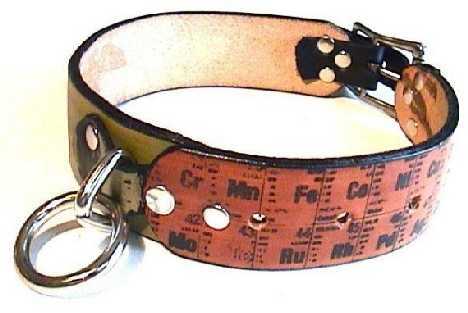 The Periodic Table Dog Collar looks great and stands up to use and abuse whether the activity is huntin’ or fission. Say kids, not getting enough Lead in your food? Looking for a new way to ingest Mercury? 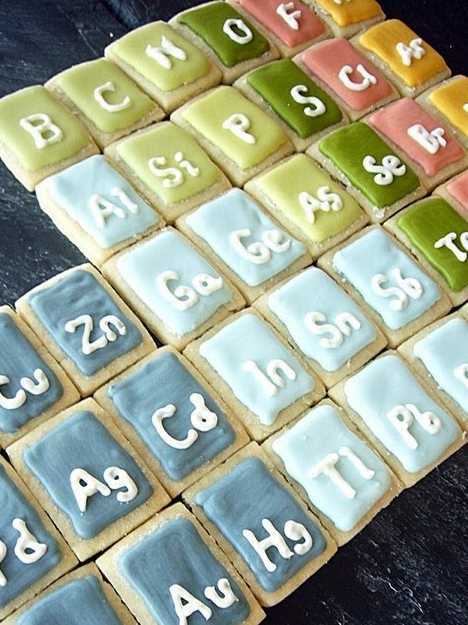 Step right up and dig into these scrumptious Periodic Table Cookies, fresh out of the oven or, we’re guessing, cooked with a Bunsen Burner on one of those asbestos-coated screens from school science class. Remember those (*cough*)? Just try using one today; you’ll have a hazmat team on your case in minutes flat. If Cosmo Kramer can wow ’em on Regis & Kathie Lee with the Coffee Table Coffee Table Book, you can impress the best with the Periodic Coffee Table. 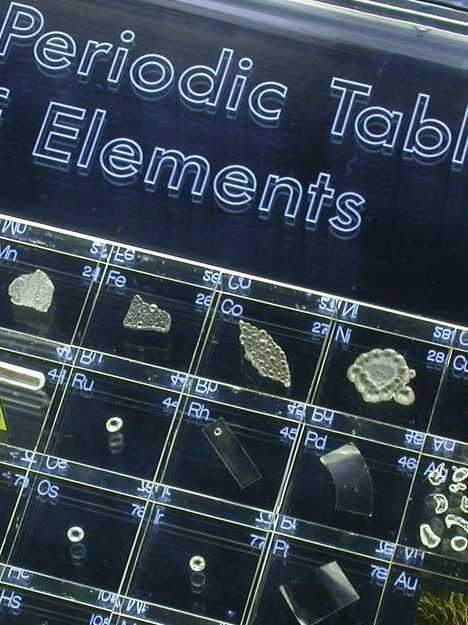 Mind you, it’ll cost you close to $9,000… with over 100 samples of elements such as Gold and Platinum sealed in clear acrylic plastic blocks, you can understand the need to part with some substantial Silver and Copper. Good news, everyone! 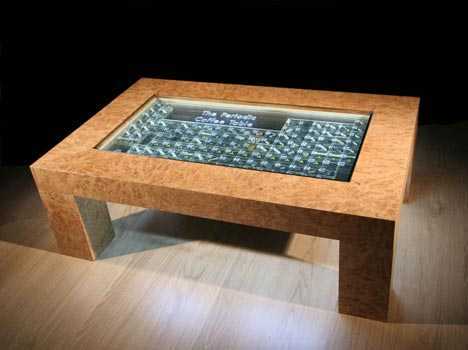 The Burred Oak table is topped with a sheet of tempered glass and the more reactive elements are isolated in ampoules of mineral oil or Argon gas as required in the interest of elemental preservation and owner safety. The table measures 4 ft x 2.5 ft x 16 inches (120 x 80 x 40 cm), big enough to host your next egghead get-together. Hey, who didn’t use a coaster?? Wernstrom!! Mendeleev may loom large in the pantheon of scientists today, but in his time he struggled to find acceptance from his peers – he missed out on snagging the 1906 Noble Prize for Chemistry by a single vote. 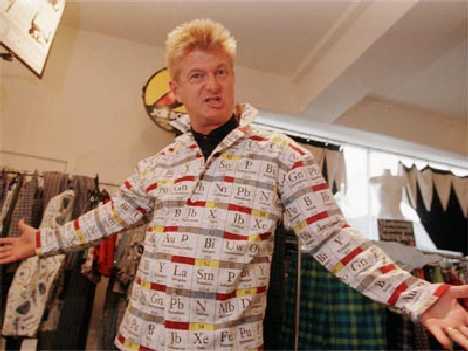 Maybe he should have flaunted his discovery by rocking the uber-geeky Periodic Table shirt shown above. Dmitri may have lost out on the Noble Prize but he’s been given a different, perhaps more appropriate type of recognition: element number 101, known as Mendelevium.